We are business led, scientifically driven. with a particular focus on the creative industries, audio & music. in order to find the most innovative & useful applications of AI. by solving real-world problems in the creative industries. Check out our deep learning framework for intuitive audio search & recommendation. To build an end-to-end A.I. stack that enables human creativity at every stage of the creative process. Courses in A.I., machine learning & deep learning. It is our mission to enable software developers & decision makers within every business to develop theoretical and practical understanding of machine learning & deep learning, including core principles and specialist topics. Artificial intelligence will revolutionise every industry and we want to enable you and your business to lead the way. Our multi-disciplinary agile teams work with your existing business, data and software teams on end-to-end machine learning development projects. Our deep learning framework for enabling intuitive audio search within your platform. We don’t believe in hype. With all the noise around AI, it can be hard to know what is relevant for your business. We don’t believe that any solution is going to immediately solve all your problems. We believe that AI is most valuable when it is useful. We aim to enrich the human creative process through solving problems in existing creative workflows and making useful tools for creatives. We don’t believe AI is “intelligent”. Words such as “artificial intelligence” and “machine learning” have erroneous connotations of human-level critical thinking. AI technologies such as neural networks & deep learning require human experts and businesses to work together intelligently in order to achieve meaningful outcomes. We do believe the technologies behind AI are powerful. Applied in the right way to relevant problems and good data, AI technologies can achieve things that have not been possible before, and make a real difference to your business. We do believe in a strong relationship between industry & academia. We believe that exciting & useful things happen when cutting-edge research meets everyday problems & dreams. We maintain strong links with the academic community - our co-founder Kevin Webster is an Honorary Research Fellow in the Mathematics department at Imperial College London where he teaches the PhD course on Deep Learning. We believe that a multi-disciplinary approach and diverse teams are required to find the most innovative and useful applications of AI. We do believe that successfully implementing AI requires a partnership. Achieving success with AI technologies involves identifying the right business problems and applying the technology iteratively. 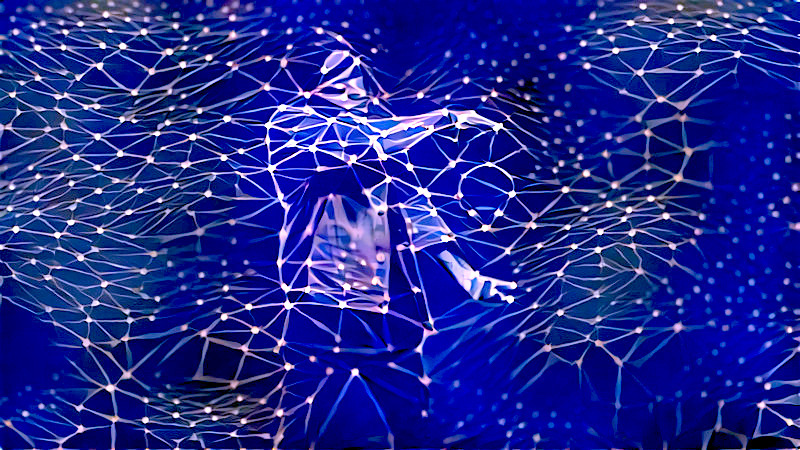 With deep knowledge of current research and technologies, we are the bridge between the creative industries and the possibilities of machine learning. We’re happy to talk about anything A.I. - we’re human. Whether you already know how you want to apply machine learning or are at the beginning of exploring this field, we'd love to hear from you. If you have questions about optimisation, forecasting, decision-making, resource-allocation, scheduling or resilience, or you have data from which you would like to unlock new opportunities, Cristina can work with you from formulating the problem statement through to designing and managing the development of a solution. Talking about the use of machine learning in media and television with David McClelland for Samsung and John Lewis. Creating a future workforce of A.I. practitioners. …we nonetheless were spontaneously contacted by over 600 people from all round the world who wanted to know if they could take this course too. We are beyond excited to welcome Jeremy Silver to the FeedForward team as Chairman of our board. Jeremy is a powerhouse within the digital industry and has been instrumental in shaping music technology as we know it today. He was an early strategic advisor to Shazam (also recently acquired by Apple). He was CEO of Sibelius Software (acquired by Avid). He co-founded Uplister Inc, the world’s first playlist sharing service. He was Worldwide Vice-President of New Media for EMI Group in Los Angeles and before that Press Director at Virgin Records where he worked with Meat Loaf, Genesis, Massive Attack. Brian Eno, and Bryan Ferry among others. Giulio is a PhD student at Imperial College London in the Institute for Security Science and Technology. His current work focuses on adversarial machine learning in the development of novel machine learning algorithms and defences. Furthermore he is examining how recent advances in machine learning can be used and extended for cyber attack detection. We’re happy to be featured in Sammy Andrews (CEO of Deviate Digital)’s column, Viewpoint, in Music Week. Welcome to the first of many columns I’m going to be writing for Music Week. Expect a mix of futurology, topical digital debates and perhaps the occasional swear word if I’m in full-on rant mode! I thought I’d kick off my first column with the recent news that Spotify is testing direct artist uploads. It’s the latest in a series of moves and shakes at Spotify that I heavily suspect are part of a wider play. Direct content upload is far from a new idea. YouTube, SoundCloud and even Pandora have all had this function for years (along with content ID systems that Spotify will now have to deploy when this rolls out widely) but, as Spotify currently claims 36% of the global music streaming market, this is a significant development that will undoubtedly impact artist deal decisions going forward. At the end of September, FeedForward was pleased to sponsor ISMIR 2018 (International Society for Music Information Retrieval) and the team spent an excellent week in Paris. Here’s a round-up of the key things we took away from the week. Whilst the field of MIR is decades old and deep learning has only been making a significant appearance over the last five years or so, basic deep learning models are already competitive with or outperforming the existing traditional state of the art models. First Deep Learning Day at KDD co-organised by FeedForward co-founder. A.I. chat - join Lydia on the Alexa Stops podcast discussing current topics in A.I. with Robert Belgrave, CEO of Wirehive & Jim Bowes, CEO of Manifesto.